Posted on April 4, 2016 | Comments Off on What Is Cellular Health? One might wonder how many cells make up the human body. While the question appears simple, the answer most certainly is not. Cells are not uniform in size or in density. Red blood cells, for example, are tightly packed, while skin cells are much less dense. Dependent upon whether cell numbers are estimated by weight or by volume, the answers are entirely different. Scientists have determined, however, that the body comprises approximately 37.2 trillion cells, each with a particular function, including 2 billion heart muscle cells, 50 billion fat cells and the 240 billion cells that comprise a healthy liver. 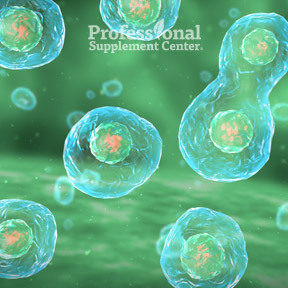 While cells are individual in structure, they work synergistically to support and maintain all vital bodily processes. Whether one has good health or poor health is determined at the cellular level. Put this into perspective and one may realize the importance of good nutrition, as without adequate nutrients normal cellular functions become impaired and eventually health suffers. Vitamins, minerals, amino acids, essential fatty acids, trace elements and other nutrients are necessary to support the thousands of biochemical reactions taking place in every cell that drive all human bodily functions. Every process–from the beating of the heart, to breathing, to walking, to brain function, to immune response–is supported by energy produced in the cells’ mitochondria. This chemical energy, known as adenosine triphosphate or ATP, is essentially the energy currency that we spend to support life. Over time, nutrient deficiencies cause long-term DNA damage to the cells, and that damage is believed to be a cause of chronic illnesses and cancers. The human body, in its amazing ability to survive, addresses short term nutritional deficiencies by taking what it needs from other parts of the body. Vitamin D, for instance, is necessary for normal calcium metabolism. When one is vitamin D deficient, calcium is not properly absorbed. Consequently, the body takes calcium from bones, leaving one more susceptible to developing osteoporosis. Statistics show a very small percentage of us get even the minimum amount of recommended daily nutrients, let alone the proper amounts the human body requires to support cellular energy production and optimal wellness. Scientific evidence has shown that addressing cellular energy production with adequate nutrition may help to prevent or reverse infirmities associated with the aging process. Research shows that increased cellular energy production helps the body to function at optimal levels. The heart has a high concentration of mitochondria within with heart cells to produce the tremendous amount of energy required to meet the heart’s huge energy demands. While the heart is susceptible to free-radical oxidative stress and premature aging, it is also responsive to targeted nutritional support. Nutrients such as CoQ10, L-carnitine and D-ribose help to maximize the amount of oxygen the heart can extract from the blood, supporting conversion of nutrients into energy. CoQ10 – Necessary for the conversion of energy from carbohydrates and fats into ATP energy used by the cells, CoQ10 plays an important role in mitochondrial energy production and functions as an antioxidant in mitochondrial membranes. D-Ribose – This simple 5-sided sugar supports ATP production in the cardiac and skeletal muscle and aids the heart’s muscle contraction. Documented research supports the benefits of D-ribose for enhanced physical strength, greater endurance and less free radical stress during strenuous exercise. Acetyl L-Carnitine – Especially helpful for the skeletal and the cardiac muscles which use fatty acids for fuel, this amino acid aids cellular energy production by transporting long-chain fatty acids into the mitochondrial matrix where oxidation occurs. Antioxidants – Antioxidants such as Vitamins C and E, glutathione and alpha lipoic acid work within the plasma, the cell membrane and within the cell to help reduce free radial damage resulting from oxidative stress and energy production. D-Ribose by Designs for Health – Used by all living cells as an essential compound in cellular energy production, D-Ribose is necessary for ATP synthesis that supports normal health and function. One daily serving provides 5 g of D-Ribose for adequate energy enhancement. Gluten, soy and dairy free, Non-GMO vegetarian formulation. Bio-D-Mulsion Forte by Biotics Research – One drop provides 2,000 IU of vitamin D, as cholecalciferol, in a concentrated micro-emulsion formula for enhanced utilization and absorption. Gluten free. Endogenous Antioxidants & Cofactors by Pharmax – Formulated for good health maintenance, this broad spectrum product helps to boost levels of the whole range of cellular antioxidants, including glutathione, ALA, Vitamins C and E, and CoQ10. Vegetarian formula. Acetyl L-Carnitine by Douglas Labs – One serving provides 500 mg of naturally occurring L-carnitine, shown to maintain cellular membrane stability, aid restoration of age-related membranal changes and provide antioxidant protection. Gluten, soy and dairy free formulation. Ubiquinol CoQ10 by Bioclinic Naturals – This highly absorbable and bioavailable form of CoQ10 performs well established roles as a free radical scavenger in mitochondrial and lipid membranes and as an electron carrier essential to cellular respiration and ATP production. Gluten free, Non-GMO formulation. This entry was posted in Home and tagged Acetyl L-Carnitine, Acetyl L-Carnitine by Douglas Labs, antioxidants, Bio-D-Mulsion Forte by Biotics Research, Cellular Health, CoQ10, D-Ribose, D-Ribose by Designs for Health, Endogenous Antioxidants & Cofactors by Pharmax, Professional Supplement Center, Ubiquinol CoQ10 by Bioclinic Naturals, Vitamins and supplements, www.professionalsupplementcenter.com. Bookmark the permalink.